The First International Scout Conference was held in London, in 1918. The 6 participating countries that had introduced the Scouting System were Belgium, Denmark, England, France, Greece and Serbia. Greece was represented by General Chief K. Melas who suggested the establishment of periodic international scout gatherings in the same way the Olympic Games were held. His suggestion was accepted with great joy by Baden-Powell and the rest of the conventioneers. It was the birth of the "Jamboree", an purely greek concept. 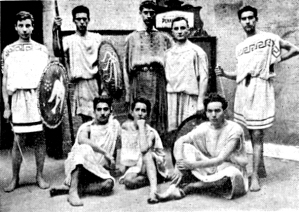 The 2nd International Scout Conference (Paris 1922) were Greece, as well, was present. The first international scout camp (Jamboree) took place two years later in London, at the same time with the first official World Conference of the Administrations of the Scout Organizations, the summer of 1920. SEP was represented in both; a Troop under Lefkaditis went to the Jamboree and K. Melas went to the Conference where, in tha name of the "king of Hellenes", awarded the Founder of the Scout Movement, Baden-Powell, with the Superior Phoenix Commander. 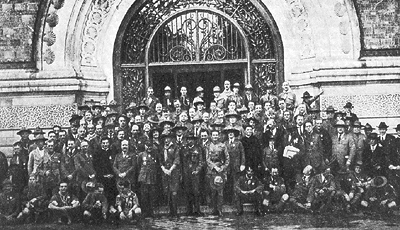 The 2nd International Scout Conference in Paris 1922 was in effect the General Assembly of the Scout Organizations of the world. In that conference, the constitutional map of the World Scout Organization was voted through. The World Scout Organization was founded by 22 countries, including Greece, that was then represented by General Chief Leon. Pteris and Isaias Isaias. Since then, Boy Scouts from Greece participate in every World Conference and Jamboree everywhere on the planet. Greek delegations shined in those first meetings and often participated with more than 30.000 Scouts and Leaders. The perfect appearance in combination with the scout and athletic performance in the Jaborees, placed SEP in the first line of World Scouting.